German physician; born at Lyck, province of East Prussia, June 4, 1860. He received his education at the gymnasium of his native town, at the Grauen Kloster in Berlin, and at the universities of Berlin and Heidelberg, taking his degree as doctor of medicine at Berlin in 1883. In the same year he established himself as physician in that city, where he now (1903) practises, making a specialty of the treatment of ear- and nose-diseases. 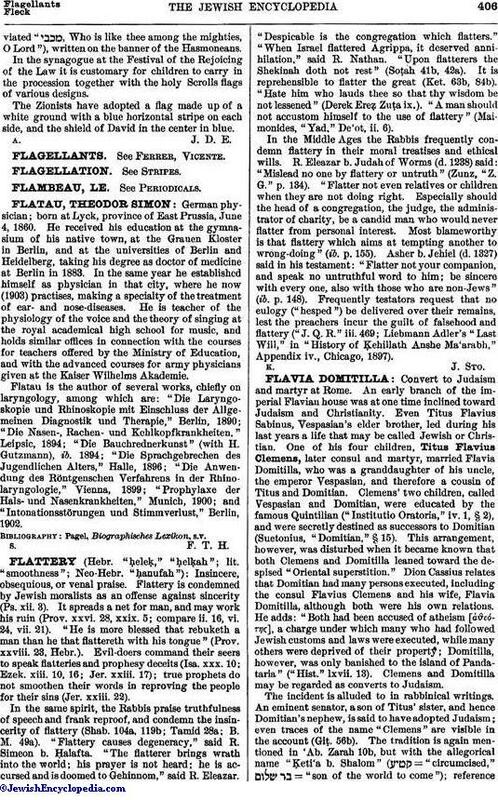 He is teacher of the physiology of the voice and the theory of singing at the royal academical high school for music, and holds similar offices in connection with the courses for teachers offered by the Ministry of Education, and with the advanced courses for army physicians given at the Kaiser Wilhelms Akademie. Flatau is the author of several works, chiefly on laryngology, among which are: "Die Laryngoskopie und Rhinoskopie mit Einschluss der Allge. meinen Diagnostik und Therapie," Berlin, 1890; "Die Nasen-, Rachen- und Kehlkopfkrankheiten," Leipsic, 1894; "Die Bauchrednerkunst" (with H. Gutzmann), ib. 1894; "Die Sprachgebrechen des Jugendlichen Alters," Halle, 1896; "Die Anwendung des Röntgenschen Verfahrens in der Rhinolaryngologie," Vienna, 1899; "Prophylaxe der Hals- und Nasenkrankheiten," Munich, 1900; and "Intonationsstörungen und Stimmverlust," Berlin, 1902.